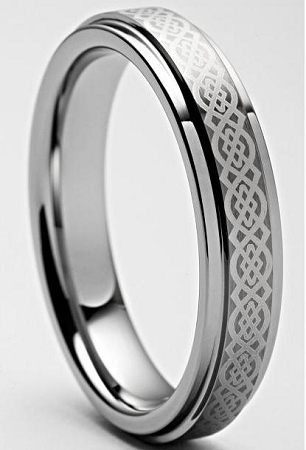 This stylish tungsten carbide ring features a Celtic Knot pattern along the center with rounded polished sides. Whether this is for a modern wedding band or accessory - it is sure to complement any style. This ring also comes in a 8mm matching style. Was this answer helpful? 21 of 24 Customer(s) found this Answer helpful. Q: What if I order the wrong size? Can I get this ring sized? If the ring does not fit, you can send it back to us to have it replaced for a new size. Tungsten is not able to be resized, so that is why we will replace it for a new size for you. We will exchange this for you as a courtesy the first time, so you will get that perfect fit! Hope this helps! Thank you, TF! Q: can this ring be made with the design part in gold? A: We can make this in gold for you, it will take 3-5 days extra to ship if that is okay, but we can do this for you. Q: does the rings fit true to size ? Q: what is the mm of this ring ? This ring is very nice and feels good on your hand. Smooth touch edges so, it doesn't rub in between the fingers. great for a simple wedding or val renewals. Nice matching mans ring! This ring is absolutely fantastic! The price was amazing too! It shipped super fast so I didn't even have to wait long to get it. I highly recommend buying items from this company. Outstanding!!! Incredible value, delivered quickly, no complaints! After getting interested in Tungsten rings, I figured I'd give this one a shot as an anniversary gift for my girlfriend. She absolutely loved it! The design is gorgeous, and for the price it can't be beat. Highly recommend! I was incredibly impressed both with the quality of the product as well as the quality of your customer service. I have NEVER experienced better service and I truly mean that. As for the product it was gorgeous. The photo does not do it justice and I am looking forward to wearing this on my wedding day. Thank you!! Love this ring, I wear it constantly. I have only had it a few weeks but I have no complaints!! How could I with the price, free shipping and lifetime guarantee, this has got to be the one of the best deals ever! I like this dainty ring. We ordered a ring for me after my husband really enjoyed his new wedding ring from this site. I like Celtic designs so I got this one. It's narrow and dainty enough to stack with other rings, which I love. I will say that the design isn't as visible in real life as it seems on the picture. I'm sure on the men's version it is due to the width, but on this ring made for women, it's hard to see unless you're right on it. Other than that, no complaints. I like the look of the ring but the Celtic design on the 6mm is so small you cannot see it with out a magnifing glass. I returned the two rings and ordered another two of a different design. No patterns. Not sure how I found this website but very happy that I did! I bought this ring and the matching one for my husband. Love the loss of both the rims and are extremely comfortable to wear! I will totally continue to buy from this company! I ordered this ring so my husband and I would have matching wedding bands. Its so comfortable and elegant looking. Fast shipping and a perfect fit. Is order from this company again in a heartbeat! I really like the ring. The edge is a little rough but it doesn't bother me. My wife and I looked at the design of all the ring. We desided to order the Celtic design. the 5mm ring celtic design does not show up as well as the 9.5mm ring does. these rings are very fashionable. My wife and I are very pleased with the rings. they are very comfortable. Very nice looking ring. Seems to be really well made and an exceptional price. Arrived very quickly. Would recommend. I bought this ring for my teenage daughter. She wears this ring every day. She can't get over how light it feels on her finger. She is an Irish Dancer so it would be nice to see the design more prominent on the ring but the quality of the ring itself is fantastic. I love the ring, but it's too small and I will need to send it back for replacement. I Love my ring!! It is so beautiful. I am so happy I bought this for myself. The design is intricate and the quality- can't say enough. So thankful to have come across Tungsten Fashions. I recently had to replace my wedding ring, which I lost at the beach. My husband had ordered a tungsten ring to replace his wedding ring which he had outgrown. So, I ordered a ring to match his. We love them both. They even exchanged the first one I bought for a smaller size. Very good service. Love this ring it is beautiful. The design is lovely and the fit is so comfortable.I will definitely purchase from this place again.